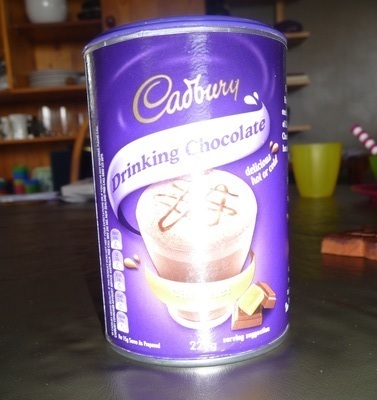 I was looking for plain drinking chocolate but bought the Caramel flavour by accident as the packaging is very similar. The caramel makes it sweeter than I was expecting. I don't normally add extra sugar to drinking chocolate so I found this a bit too sweet. The consistency was fine, though. It stirred in well. I kind of resent that the instructions tell me to make it with skim milk. I'm having hot chocolate, not some sort of special health drink. They then suggest that I might like to sprinkle it over ice cream or add marshmallows to it. Mixed messages, Cadbury! It's even worse with shampoo and conditioner because if you wear glasses or have shampoo in your eyes you can't tell the difference between the two once you're in the shower unless they make the bottles a different shape or something. And, I have done the same thing as you Jennifer, picking up things that are a far different flavour. Not shown clearly on the pkt or box or jar. I have a pet-hate with Shampoo and Conditioner for that very reason.